I am in France, back in my hometown where I grew up with all the people dear to me from my childhood. Living an ocean away from my family has been a real strain, and I recently decided that I need to come visit more often. It’s a wonderful place to return to, of course, but the main motivation is to see my parents, my siblings, my family. Wherever they are is where I want to go. I’m not sure what brought on these reflections, perhaps the realization that life is going by, my parents are aging, I am aging, and I just don’t want to miss out too much on those special moments together, while there still is time. I find that what I like to recall are those memories of vacations spent together, my childhood, family life. Pictures of my childhood, my wedding, my children growing up… pictures in an album, on a table, on a wall, time capsules of favorite memories. I don’t sit in front of my computer sifting through folders looking for an image here and there, I like to sit on the couch alone or with someone, my sister, my husband, my daughter… turning the pages of photo albums, reliving these precious stages of our lives. I like to walk in my hallway and see a favorite picture of Will, Meg, Olivia and Rose on a beautiful snowy Christmas in Provence. I don’t like to look at the tiny phone screen (or is it just me? but even on my macdaddy Iphone screen I have to squint now!). I get so much joy from a PRINTED image, and not so much from a digital file somewhere on my computer, or “the cloud”.. And I am dubious about the life span of those digital files: at first we had floppy disk, then DVDs, now flashdrive, the changes are happening in just matters of a few years. A computer will not last forever, most of your pictures stored will likely be lost with it, when it just dies on you. Most people don’t save, organize their phone pictures. Photographers are calling this generation the “most photographed generation, yet, the one who will have the least images”. A digital file is the equivalent of a negative. You keep it for a back up, but the printed image is what you look and cherish, the vector of your memories. If you hire a professional photographer, you should expect a professional product, something to hold and look, giving you the instant gratitude of a beautiful special moment of your life. It should bring you joy. Marie Kondo would most likely not advise you to go spend your money with a photographer if you won’t even be rewarded with something that brings you joy. A flash drive won’t do, (it’s important to get TOO, for sure) but you should leave with a tangible, visible portrait. “Digital” alone is not enough. I choose to give my clients printed images, and with each printed images, I give the matching (in size) digital file, should anything happen to your print, you can print it again. Last night I went with my parents to celebrate one of their best friend’s birthday. The house was lovely and warm. What made it so inviting to me were the images on the walls, the story of their life in pictures. Françoise delighted in pointing to each picture and telling me about her 3 children, the grand children…During the evening, one of the guests asked about the first time they all started to celebrate their birthdays together, and the hostess turned to a shelf stacked with big albums and out came memories flooding. An other guest brought as gift a wall collage of pictures from all their trips together… Pictures in albums, or exposed are beautiful reminders of moments of joy. I quickly snapped with my aunt’s cell phone a picture of just one wall of their living room, I felt it illustrated perfectly how I feel about printed images. 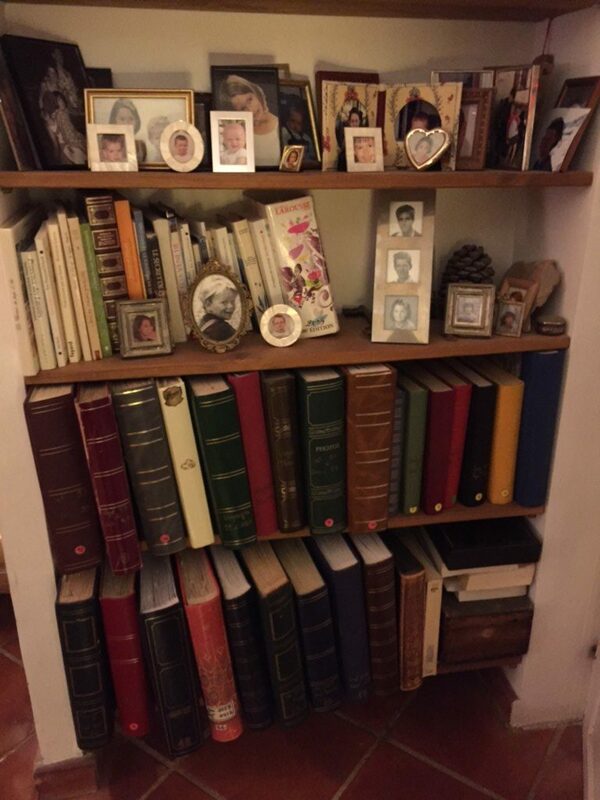 Those big leather books are all photo albums. I’ve also heard from people who lost their home unexpectedly (fire, hurricane…) that the first thing they try to save are their pictures, or what they especially wished they could have saved were their images. There are milestones to document. I personally feel very strongly about the newborn stage and think everyone should have a few very good images of their newborns. I don’t have any of either of my 3 children and I really wish I could go back in time to rectify that. I could probably argue we should journal in images rather than words. Document your life in images. Let me take care of the newborn images, and you do the rest! And for the love of God, print your digital files! So that you can enjoy them!